Fairmount Park Live Horse Racing in Collinsville Illinois every Tuesday afternoon beginning Tuesday, April 16th, and every Saturday evening beginning Saturday, May 4th; ending September 14th. Tuesday post time is 1pm. Saturday post time is 7:30pm. (Exceptions: no races on Saturday, August 31st and Tuesday, September 3rd. Special Labor Day, Monday, September 2nd post time, 1pm.) Admission is $1.50 on Tuesdays, $2.50 on Saturdays. See website for more information. 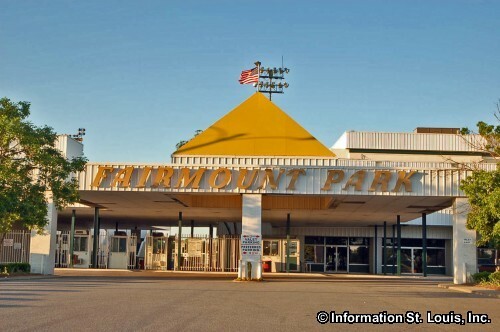 Fairmount Park is a professional horse racing track and is located in Collinsville Illinois, just minutes from Downtown St. Louis. Live horse racing happens at Fairmount from May and into September. Directions: Fairmount Park Race Track is located on Collinsville Road, just west of Interstate 255 and south of Interstate 55.